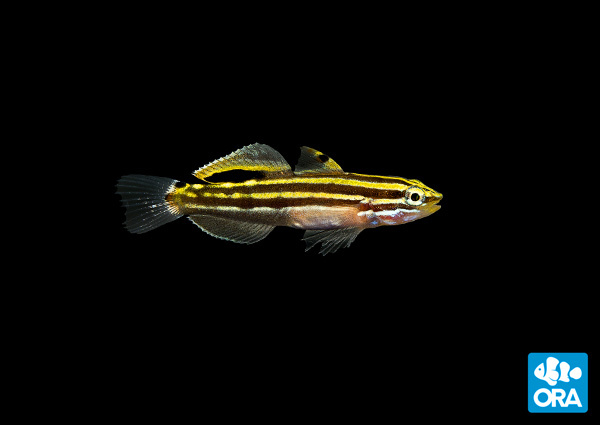 ORA announces success with the popular Hector’s Goby (Koumansetta hectori). We are pleased to announce our recent success with the popular Hector’s Goby (Koumansetta hectori). This attractive little fish measures only 2” at maturity and spends its time hovering over rocks and substrates out in the open water column. Known for their bold yellow stripes, peaceful disposition and diet of filamentous algae, the diminutive Hector’s Goby is a nano reef favorite. Many aquarists know this fish as Ambylgobius hectori but accepted name is actually Koumansetta hectori. C-Quest in Puerto Rico is reported to have raised the closely related Rainford’s Goby in the late 1990′s but we believe that this was the first time the Hector’s Goby has been raised. The Hector’s Goby proved to be quite difficult to raise. Our broodstock have not been reliable spawners and thier larvae are as fragile as they are tiny. This species also has a rather long larval duration, lasting approximately 60 days. It quickly became apparent that many of the same challenges we experienced with the Priolepis genus would again apply when raising this particular species. With each larval run we develop and refine specific procedures to help increase our yield but we haven’t perfected our technique just yet. While we have the ability to spawn and raise this fish in captivity, the costs involved in doing so at this time are likely far greater than the hobby will bear. We are particularly enamored by this genus and plan to further explore the challenges presented by these tiny fish. ORA hatchery technicians are continually expanding our selection of live feeds and our ability to manipulate environmental conditions during the larval rearing process.We are confident we will overcome the challenges of raising the Hector’s Goby for aquarists everywhere in the near future. Editor’s Supplemental – As this press release from ORA implies, they believe this is the first successful rearing of this species. It is worth noting that K. hectori has been included on our captive-bred list since the first 2012 compilation. However, the voracity of its appearance, upon deeper investigation, has been called into question as no original source of the claim can be properly identified and confirmed. All doubts now aside, ORA has proven this species can be bred in captivity.